Now the literary and human rights organization, which includes thousands of authors and journalists, is taking a more direct step: Suing the U.S. president. In a suit filed Tuesday in Federal Court in Manhattan, the centre, also known as PEN America, alleges "official acts" by Trump have "violated the First Amendment and his oath to uphold the Constitution." None of the allegations have been tested in court. But in the lawsuit, PEN cites such examples as reports that Trump was meddling in the , a frequent target of Trump's anger. The Justice Department has sought to block the merger. The suit also notes Trump's comments on Washington Post owner and Amazon.com founder Jeff Bezos. Trump, unhappy with the Post's coverage, has and suggested raising its shipping costs. According to the Post, he has pressured U.S. Postmaster General Megan Brennan to double the rates. Last week, the United States Postal Service proposed some hikes for 2019, among them increases that would affect Amazon. Shipping costs have been raised several times over the past decade. An email sent to a White House spokesperson shortly before the suit was filed was not immediately returned. 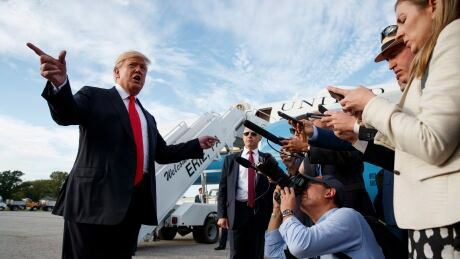 In an interview this week with The Associated Press, PEN's chief executive officer, Suzanne Nossel, said Trump had moved beyond harsh and legally protected rhetoric such as "fake news" and "enemy of the people." "There is widespread concern that the president is actually extracting reprisals on the media for coverage he considers unfavourable," she said. PEN is asking that Trump be enjoined from "directing or ordering any officer, employee, agency, or other agent or instrumentality of the United States government to take any action against any person or entity with intent to retaliate against, intimidate, or otherwise constrain speech critical of him or his administration." The organization seeks no money beyond "costs, including attorneys' fees," and other "relief as the court deems just and proper." Trump has been sued thousands of times over past the few decades, and shortly before taking office,he agreed to pay $25 million US in a settlement over fraud allegations against the now-defunct Trump University. He also has been sued as president, including on First Amendment grounds. Last month, a Federal Court in Cincinnati ruled that protesters at a Trump rally in March 2016 in Louisville, Ky., could not sue him for inciting violence, finding nothing incriminating in his remarks. Earlier this year, the Knight First Amendment Institute sued Trump and his communications team for blocking several people from the president's Twitter account. A judge in the U.S. District Court for the Southern District of New York, where PEN's suit was filed Tuesday, ruled in May that blocking Twitter critics violated the First Amendment. "We wouldn't be filing this lawsuit if we didn't think it would be meritorious," said David A. Schulz, co-director of the Media Freedom and Information Access Clinic, a Yale Law School program serving as co-counsel with the non-profit, non-partisan Protect Democracy on the lawsuit. "There is so much evidence of the president's motives." One issue for PEN might be how the organization and its members have been affected by Trump, what is known as legal standing. Kristy Parker of Protect Democracy said that "PEN's members, especially those who are journalists covering current affairs, are indeed directly affected by the president's retaliatory acts and credible threats because they are forced to work in an atmosphere where they could be punished by the president for their speech." Nossel added that PEN was not yet "actively asking" Bezos or CNN or other media outlets to join the lawsuit. "Media organizations are focused on covering the news objectively and providing the essential transparency and accountability that is the work of a free press," she said. "Every organization has to make their own determination of how best to play their role in this environment. That media organizations might determine to focus on journalism should not mean that the President's violations go unchallenged by those affected by them."